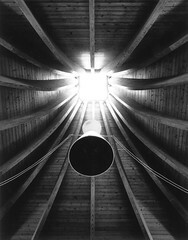 View looking up into the central skylight in the main auditorium of Armstrong's Ethical Society. Curved glulam beams are exposed at the interior surface of the ceiling. These form a pattern of lines leading directly up into the central skylight. The linear forms at the interior are reflected also in the exterior's copper roof.